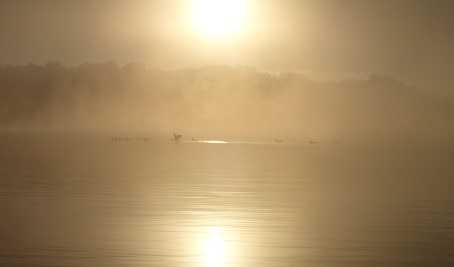 Fog that covered the lake began to evaporate as the sun began to rise from its evening slumber. Nature’s songbirds broke the sounds of silence as the kayaks blazed the calm, still water. Entrails rippled through its mirrored surface, breaking and complementing the morning quiet. Nature’s fireworks softly ushered in a new day…fireworks we can see nearly every day. We’re very fortunate to have the freedoms so hard fought for by our forefathers over our nation’s history. Thank you all. This entry was posted in Nature, Peace and tagged Nature, Outdoors, Peace. Bookmark the permalink.